I love to see how the moon appears to change colour, size and character as it moves through the sky on its nightly arc. For me, the moon is a thing of ever changing beauty, mystery and inspiration. But where I am now it’s a cold, drizzly November night and unfortunately there’s no moon to see at all as yet, though she is up there in all her glory. So here’s one I made earlier. Inspired by a moonlit night in Marrakech 8 years ago. I remember being mesmerised watching it rise slowly and lazily above the flat-roofed souks of the Djemaa El Fna in Marrakech. It was a clear late-November night, but the town’s main square was as busy and colourful as I’d heard it always is. Above the seething masses of lost-looking tourists, locals on the make, donkeys and carts, charmers and snakes, children begging, children fighting, shopkeepers bartering and the constant barrage of mopeds and bicycles, horses and goats, the moon’s bright glow cast a beguiling spell over my first Moroccan night. The warm breath of camels condensed then wafted up on the chilly breeze that had begun to sweep down from the High Atlas mountains 30 miles away. Pungent aromas steamed from cauldrons filled to the brim with earthy-tasting snails for curious tourists to try. Spicey flavours sizzled from market stall tagines and exotic vapours oozed out from deep inside the crowded souks. Here I was, only 4 hours after leaving Scotland where the same full moon cast a very different spell across the icy land that would soon be blanketed in deep and heavy snow for over a month. And a quarter of a million miles above us, indifferent to the bustling world below, the moon appeared frozen in the sky. Familiar features intoned with the cool transparent hues of Prussian Blue, spread thin across a face of brilliant white. And as I looked up, she appeared to look down, watching everyone everywhere that ever was or ever will be. And in turn, each tiny, insignificant character continued to play out their roles, heads down in the darkening night. 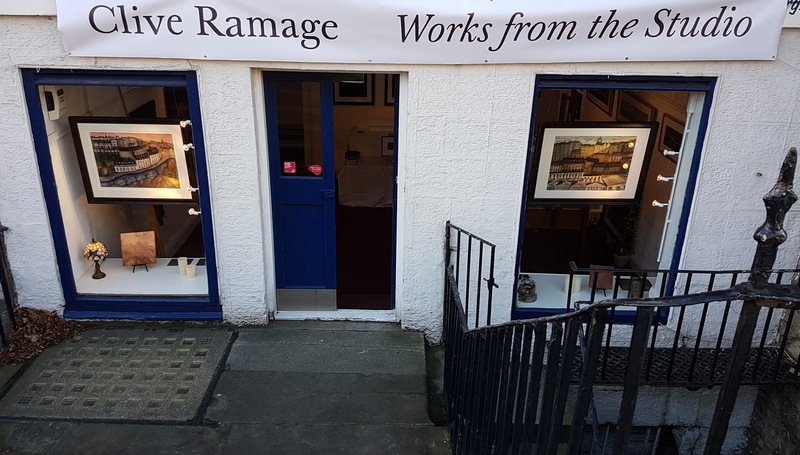 I’ve been back at Fife Dunfermline Printmakers Workshop this week for the first time in a while. All in an effort to produce something a bit different for the arTay exhibition event at Perth Festival of The Arts, which opens next week (18-21st May). 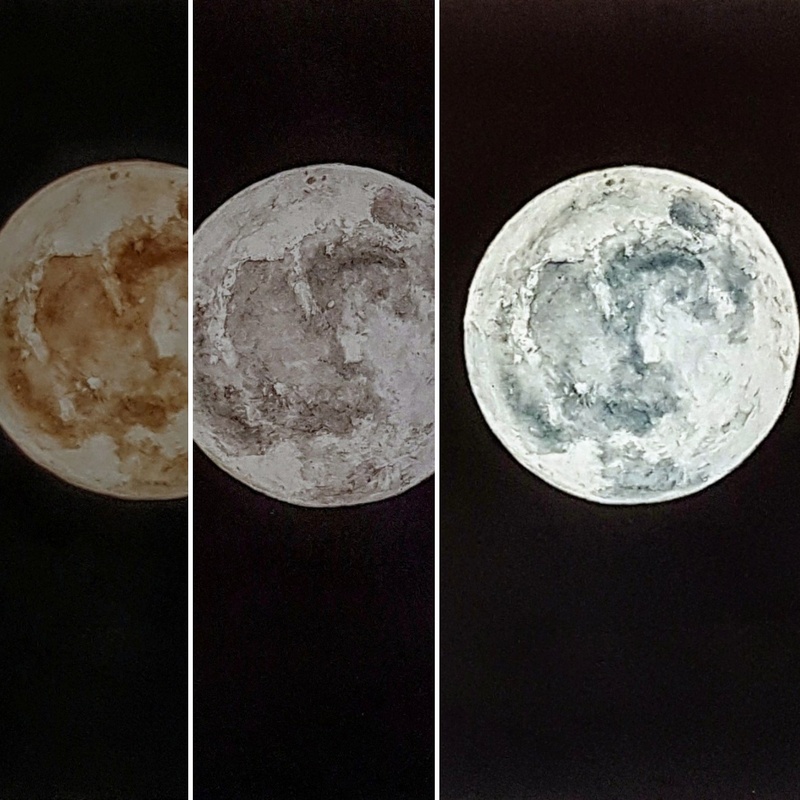 So I’ve produced these 3 different coloured versions of my Super Moon etching (image size 48x58cm). They’re off to the framers now, but do go along to the event if you’re in the Perth area and have a closer look at the moon than you’d normally get. There’s a lot more detail thank you might expect in that bright orb hanging in the sky at night. Hopefully, I’ve managed to capture a suggestion of that with these. There’s also going to be hundreds of works on show by around 60 other artists, so plenty to see. Here’s the Blue version showing the full-sized print below. 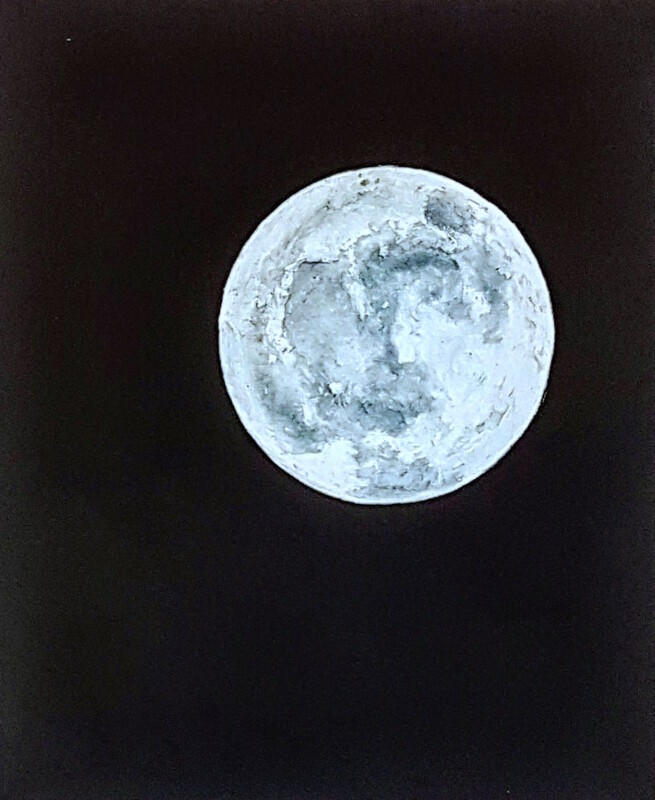 This entry was posted in New Work and tagged Art, artist, blue moon, cityscape, Edinburgh, etching, harvest moon, landscape, Moon, moons, night sky, oil, oil on canvas, print, printer, Scotland, sky, Super Moon on 12th May 2017 by Clive.